Bill Browder, cofounder of the Hermitage Capital Fund, was banned from Russia in 2005. Over the last ten years he has become an outspoken critic of the Kremlin’s regime and the driving force behind the Magnitsky Act. 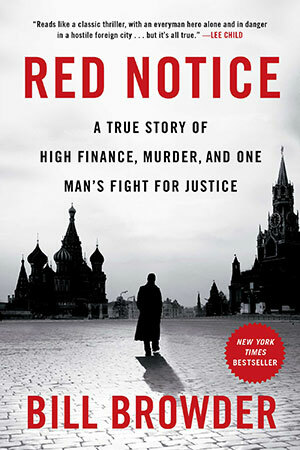 Bill Browder’s Red Notice: A True Story of High Finance, Murder, and One Man’s Fight for Justice is a story by and about a man who was bold enough—or, as he puts it, "crazy enough"—to speak publicly about the misdeeds of not only Russia’s oligarchs, but its political kleptocrats as well. “I believed I could do things that a Russian in my position would have never been allowed to do,” writes Browder. As the book unfolds, with one bloodcurdling story after another, the reader is trapped in a vortex of atrocities and misdeeds performed by Russian government officials. Several times the phrase “Russian stories never have happy endings” appears. Magnitsky’s death was followed by a series of incredibly cynical official actions. Close to the first anniversary of his death, the Interior Ministry decorated the key figures associated with the murder with national awards of gratitude at an annual awards ceremony. Additionally, a series of persecutions and killings began of other whistle-blowers who attempted to share the truth about the Russian authorities’ massive corruption and money-laundering schemes. Finally, the American legislative reaction to Magnitsky’s death, the Magnitsky Act, was followed by “a heartless proposal” that “was evil, pure and simple”: Putin’s Dima Yakovlev Law, the law that banned the adoption of Russian orphans by American families. Browder’s battle against one of the world’s ugliest regimes is not over. Each of us can help this Russian story to finally have a happy ending either by sharing Magnitsky’s tragic story, by giving this book to people who wish to know the truth about Putin’s Russia or by simply sympathizing with his indefatigable search for justice.